Remembering his wartime service in the Far East, Len Andrews, from Southend-on-Sea will make a Heroes Return 2 trip to Singapore for the first time in 65 years. 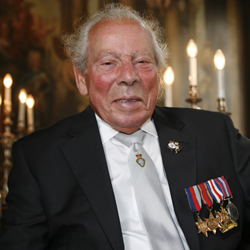 Joining up with the Royal Army Service Corp aged 18 Len became part of a demonstration platoon, training soldiers in fire arm drill and assault courses, before moving on, somewhat reluctantly, to a posting as an instructor training troops who had returned from Dunkirk. Watch Fergus Anckorn on the BBC’s HARDtalk programme talking about his time spent in Singapore and Thailand during World War II. It is the final time the veterans, most now in their 80s and 90s, are travelling as a group to pay their respects in Singapore and on the Malaysian island of Penang. One member of the association making the trip is Mr Victor Gray who lives in Plymouth and first joined the Royal Navy in September 1943 just after his 18th birthday. Victor, who is now 85, was chosen to be trained as a specialist radio operator, intercepting the enemy radio transmissions and in 1944 travelled to the Far East on the aircraft carrier HMS Victorious via the Mediterranean and North Africa. Victor explains: “We went to India and became part of the East Indies Fleet. We then set sail for Palembang and in a battle with the Japanese over two or three days we managed to destroy a third of the Japanese oil supplies. After that we travelled down to Sydney where we joined what then became the British Pacific Fleet. It was so hot, you could fry an egg on the flight deck and I actually saw that done more than once.